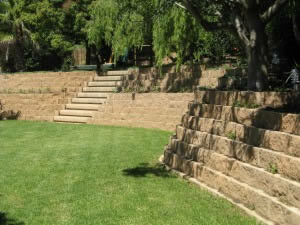 Create an ideal family garden with the Terraforce Retaining Wall System. 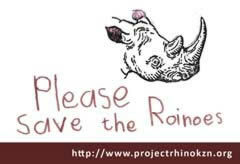 Most homeowners dream of a billiard-table flat property, with plenty of space for children to run and play. For many this will simply not happen, as many sought after family homes are often situated on heavily contoured ground, creating a need for an extensive retaining wall. 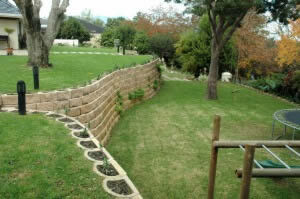 One method on how to landscape your garden that has seen rapid growth in South Africa over the last few years is the segmental retaining wall (SRW) system. Originating in Germany in the 1960s, SRWs combine the speed of building and relatively low cost benefits of a simple reinforced soil structure with sophisticated aesthetic detailing created by a facing of specially designed concrete masonry units. 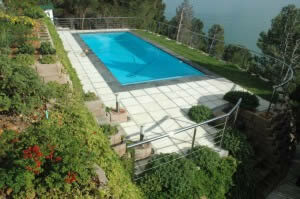 In South Africa, the Terraforce Retaining System represents one of the most versatile products available. It allows the scheme designer to incorporate features such as curves, steps and terraces; details that are difficult and costly to construct when using more conventional, in situ concrete retaining systems. In addition, the blocks are completely reversible, allowing for a round or flat face finish, with an additional rock face option. When Steve Hegarty purchased his home in Welgemoed, Western Cape, he was faced with a steep slope at the back of his property. 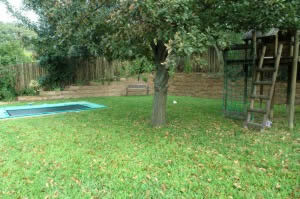 He appointed Eddie Kriel, Project Manager for Energy Master Builder, to construct three levelled sections in his garden, creating usable play and entertainment areas for his family. To allow plants to establish in the blocks, the setback of the blocks is 50 mm deep and two plant pockets are incorporated into the wall adjacent to the stairs. Planted along the top of the wall is Convolvulus Mauritanicus, a creeper that softens the wall, while the plant pockets are planted with Baleria or ‘Purple Prince’ to break the overall visual impact of the wall. 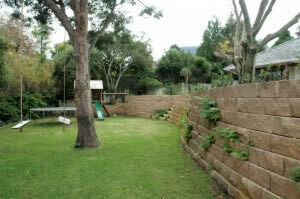 In Somerset West, the original garden of a property in Adam Tas Road consisted of a narrow strip of level ground, with the remainder sloping steeply towards the boundary fence, facing the road. For the owner of the property, Cathy Kilgour, this was not the ideal play area for her growing twin boys and their friends. To even out the terrain and create more usable space, landscaping contractor Magda Kirkham proposed two curved, undulating Terraforce walls that shape the garden into several levels of lush green grass connected by four sets of stairways constructed with the Multi 4×4 Step Block. 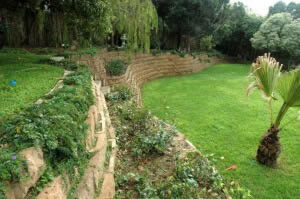 Says Kirkham: “The design of the garden had to incorporate existing plants – all plants were removed and replanted after the walls were installed by Decorton Retaining Systems – and elements such as the jungle gym, as well as new aspects such as compatibility with soccer & cricket, yet still make a statement as a feature garden with low maintenance and waterwise characteristics. The owners of a property in Gordon’s Bay, German nationals domiciled in Luxembourg, wished to transform it into a holiday home for their young family. 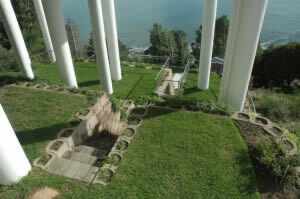 The site consisted of undeveloped land on a radical slope consisting of loose rock, rubble and alien vegetation which was totally unusable as a recreational area. 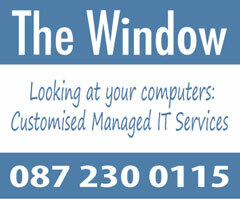 I need to know what province you are situated, so I can forward your email to the relevant supplier in your area.